The recent cold spell has coaxed throngs of Washingtonians out of hibernation and onto the frozen Chesapeake & Ohio Canal in ice skates. But is it safe? WASHINGTON — The recent cold spell may be a downer for some people, but for others it’s a frigid festival on ice. With temperatures in the upper teens and lower 20s, droves of Washingtonians young and old embraced the prolonged cold snap on Tuesday and took to the ice, skating on a frozen solid Chesapeake & Ohio Canal. “I’ve skated down here before but I don’t remember ever seeing this many people. It’s fun to see so many people taking advantage of it,” Miranda Wheeler said as her mom stood with a camera in hand on the towpath. 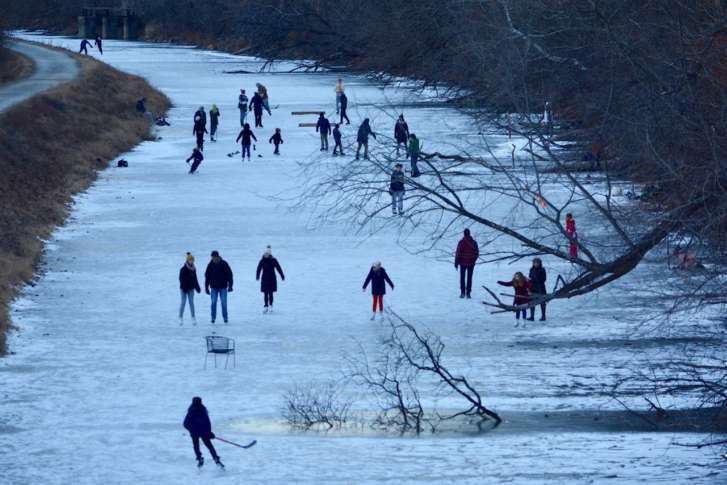 For many families, ice skating on the C&O Canal is a tradition that is increasingly difficult to sustain in a warming climate. “I’ve always liked skating down here but it’s been a while since I’ve been able to,” Wheeler said. A prolonged period of arctic air has gripped the region since late December. Temperatures have struggled to surpass the freezing mark for more than a week. The high temperature on the final day of 2017 was just 23 degrees, 16 degrees below average. Near Chain Bridge, a spirited game of ice hockey was underway as a group of fearless teens equipped with pads and sticks slapped a puck across the smooth surface of the canal. “This has been great. This is my first time playing on a pond. This is incredible,” one of them shouted. The National Park Service said that ice skating is allowed in the park but urges visitors to use extreme caution and to never skate alone. Park staff does not monitor ice conditions. An ice thickness of at least 4 inches is recommended for skating on the canal. “The ice is good, it’s about 6 inches thick. There’s three types of skaters on the ice: there’s figure skaters, there’s hockey skaters and I was skating with cross-country Nordic skates,” said Robert Gray. Gray, sporting a pair of short, Scandinavian-style blades, said he likes the extended forecast. “I love skating on the canal in the Nordic skates. Normally I have to go up to visit my daughter in Minnesota to skate. You have to watch out for springs, there are some springs of warm water that will melt the canal ice,” Gray said. Ice skating is not permitted in the Widewater area of the park (towpath mile 12.6 to 13.4) in Montgomery County, Maryland. The canal is a “skate at your own risk” area. Montgomery County Fire and Rescue officials insist the only safe ice is at an ice rink. Ice strength is dependent on water depth under the ice, currents and distribution of the load on the ice, among other factors. The Washington region is cold but it’s also in the midst of a moderate drought. The canal water levels are lower than usual, which has led to a thicker layer of ice. In the distance, cheers erupt as a slapshot lands in a goal. “It’s a blessing to be able to come out here and enjoy National Park Service land on the ice. It adds a new dimension,” a man said as he whisked across the surface of the canal.